This pdf download shows how you can establish an effective CAPA system, which interfaces there are to other systems and what content a CAPA SOP should have. Inadequate CAPA procedures continue to be among the leading findings in U.S. FDA and European GMP inspections. During the implementation of a CAPA system it should be ensured that the CAPA system is understood as an important element of the pharmaceutical quality system and, consequently, that it is implemented uniformly company-wide or group-wide, as a governing system. 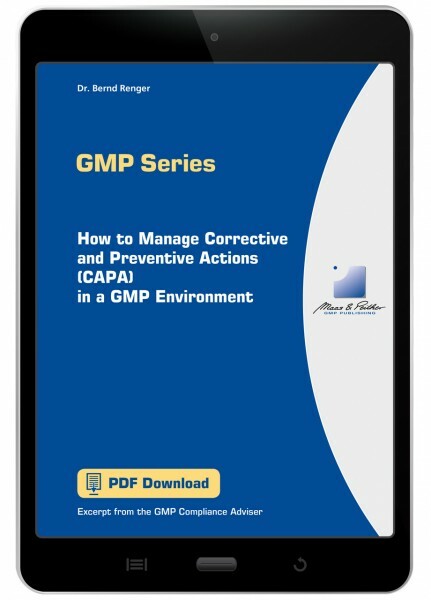 How to Manage Corrective and Preventive Actions (CAPA) in a GMP Environment is the ultimate guide on building and implementing an effective CAPA compliance program. The pdf download shows how you can establish an effective CAPA system, which interfaces there are to other systems and what content a CAPA SOP should have.